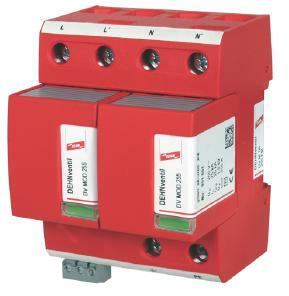 With the functional design of the new Red/Line series, the devices of the modular DEHNventil family combine safety and innovation in an impressive way. Being an "all in one device", they assume lightning equipotential bonding and surge protection in only one stage. 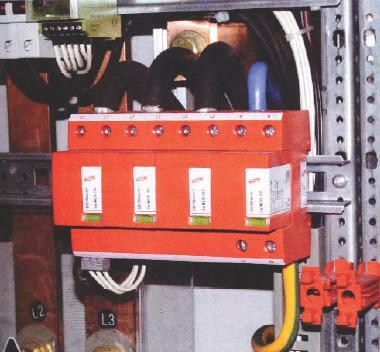 Especially for use in compact electrical installations, this function is an advantage. The design of the surge arresters according to energy-coordination criteria allows for protection of even terminal devices at short distances between DEHventil and the consumers (<5 m). Considering the lightning current discharge capacity of 100 000 A, this is a safe basis for high availability of the electrical installation to be protected. 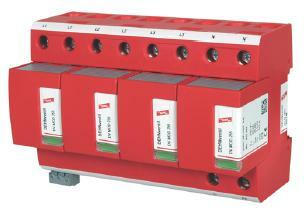 Even for expanded electrical installations, the modular DEHNventil devices provide various application possibilities. Red/Line surge arresters installed at the boundaries of the individual lightning protection zones are already energy-coordinated with DEHNventil devices. Encapsulated creepage discharge spark gaps and the small space required by the combined lightning current and surge arresters allow for easy integration into switchgear installations or distribution boards. For protecting low-voltage consumer's installations against surges, even in case of direct lightning strokes. For use according to the lightning protection zones concept at boundaries 0A - 2. A special feature of the new modular Red/Line product family is the functional design. An important component is the module releasing button. It fixes the protection module reliably to keep the safe connection to the base part even in case of maximum loads. If protection modules have to be replaced, it releases the module without requiring tools and allows to remove it easily. By using the double terminals available for all conductor connections, the surge arresters can be connected in series in a space-saving and cost-effective way up to nominal currents of 125 A, as preferred by IEC 60364-5-53. For connecting further mountable devices, busbars type MVS 3 8 6 and MVS 4 11 8 can be used. The right DEHNventil devices can be easily chosen according to the system configuration of the existing low-voltage consumer's installation and type designation of the device. Using the patented RADAX Flow technology for follow current limitation and extinction achieves high availability of the electrical installation to be protected. Even for high short-circuit currents up to 50 kArms, upcoming mains follow currents are reduced in such a way that there is a selectivity to small fuse values, i.e upstream fuses cannot trip due to arising mains flow currents. The operating state/fault indicator of each protective circuit, which is not supplied by operating currents, informs immediately about the operating state of the surge arrester. Apart from the standard visual indicator with green and red marks, types DEHNventil M .. FM have a 3-pole terminal for remote signaling. With the remote signaling contact being a floating changeover contact, the remote signal can be used as a break or make contact, according to circuit concept.